So now I’m back from holidays I can track back through my previous recipes and work out what I’ve cooked! 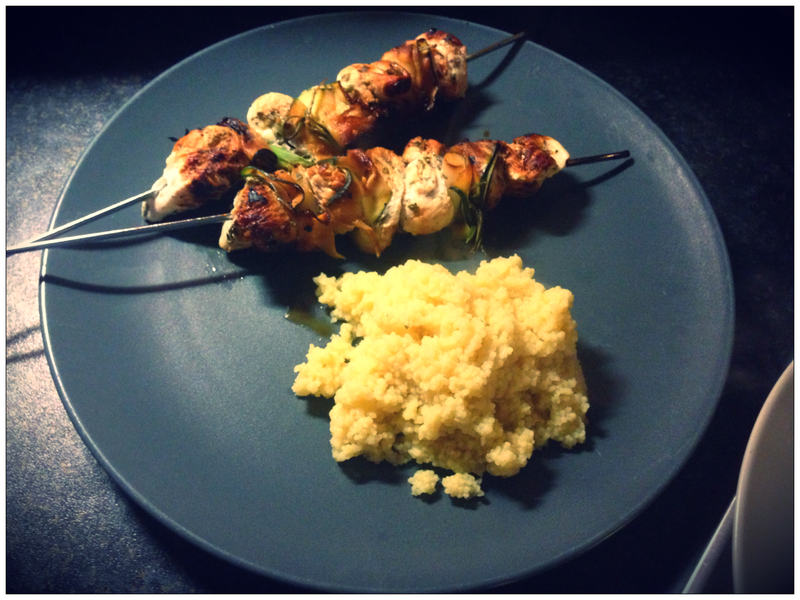 It did make me realise how much I rely on this blog to jog my memory on dishes I’ve cooked! The picture on the website made this look really watery, but actually my version was like a rich tomato pasta sauce, and I packed it with chilli flakes to give it some welly. It turns out that if you’re on a diet it makes sense to whack chilli in everything – very healthy, very low calorie and peps up the flavour in any dish! Overall, a good ‘home from work’ supper. KB rating 7/10. PR rating 8.5/10. 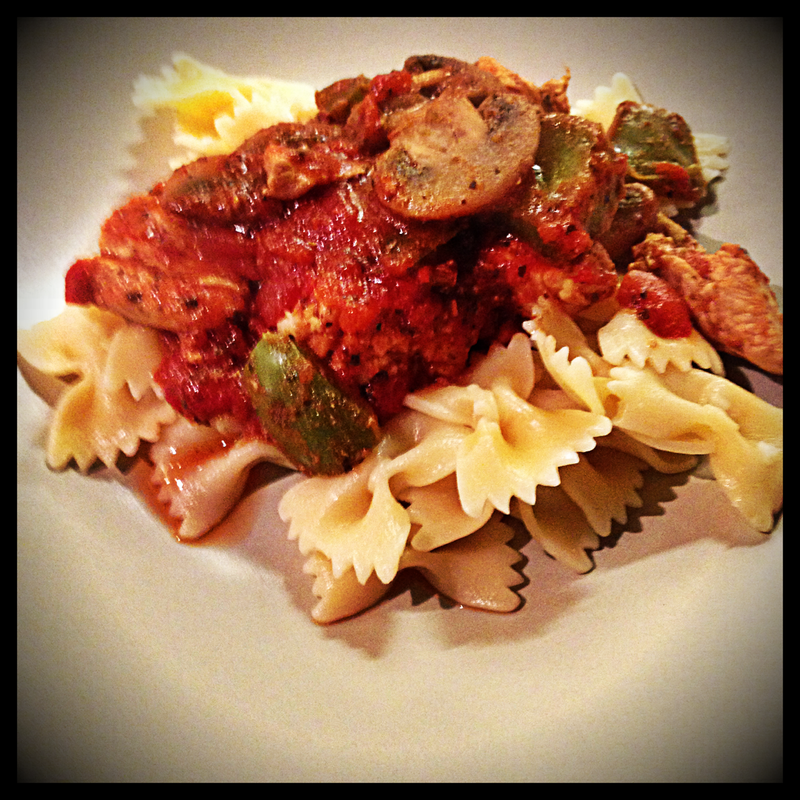 Weight Watchers Pro Points – 8 per serving. Cook pasta according to package instructions. Drain and cover with foil to keep warm. Meanwhile, heat low fat cooking spray in a large saucepan over medium-high heat. Add onion, garlic, pepper, and mushrooms and sauté for 4 minutes until vegetables are tender and mushrooms release juice. Add chicken and sauté for another 5 minutes until golden brown on all sides. Add the basil, curry powder, salt, and pepper and stir to coat. Add tomatoes and bring to a boil. Reduce heat to low, partially cover and simmer 15 minutes. Remove from heat and stir in parsley. Transfer pasta to four shallow bowls and spoon chicken mixture over top. Categories: Chicken, Reidbury Recipes | Tags: Chicken, healthy, Weight Watchers | Permalink. One of the other challenges in cooking healthy food is keeping a very meat-loving boyfriend happy too! 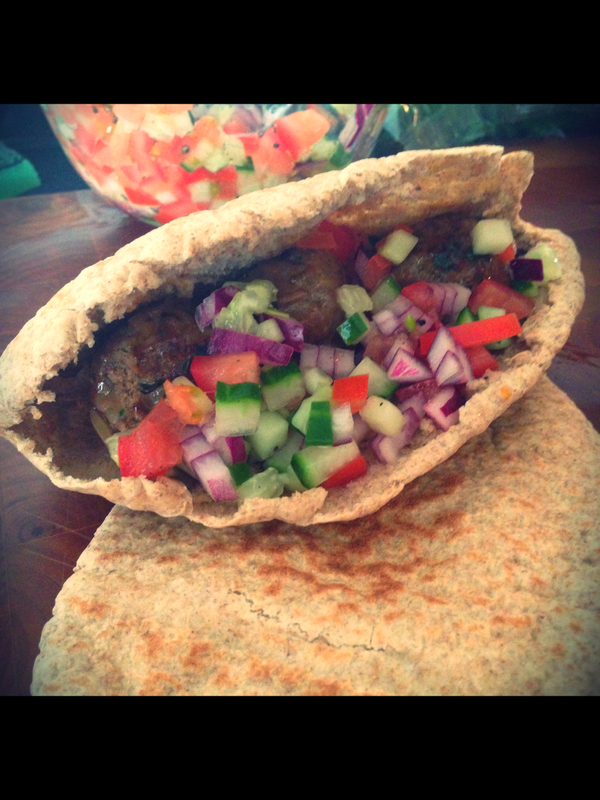 So last weekend I decided to try and find a happy compromise – hello Chilli Beef Meatballs in Warm Pittas. There’s beef, there’s chilli, there’s bread. Although I have to admit, there wasn’t a huge volume of any of those items! These portion sizes are teeny weeny, and it’s quite panic-inducing when you see just how small the meatballs are. You make 6 out of 125g of beef so they’re proper wee. But somehow when you add the bread and salsa it isn’t too shabby for a lunch at all. Unfortunately because one of these pittas is 8 Weight Watchers Pro Points I couldn’t really do my usual trick and double up the portion size. But I would do that for Paul in the future – he said that if there were two pittas each he’d have upped his score to 9! Greedy bugger. Mix together the beef mince, onion, fajita spice mix and the thyme or parsley. Season and then form the mixture into 6 evenly-sized balls. Spray a non stick frying pan with cooking spray and add the meatballs. Cook for 12-14 minutes, turning occasionally. Add the sweet chilli sauce and cook for another minute, turning the meatballs over until glossy. While the meatballs are cooking, make the salsa by combining all the ingredients. Season with salt and pepper. Warm the pitta breads in a toaster or under the grill. Split open and then fill each one with a few spinach leaves, 3 meatballs and the salsa. Categories: Cow, Reidbury Recipes | Tags: beef mince, healthy, Meatballs, Weight Watchers | Permalink. Another day, another Weight Watchers meal to try. I’m actually really enjoying researching suitable recipes to eat on this diet that don’t compromise on flavour. I’d like to think that any of the recipes I try would be ones I’d be happy trying even if I wasn’t point counting. And my Pinterest boards can really testify to the amount of research I’ve done. A particular highlight being the revelation that making no sugar jelly and adding loads of fruit is a 0 point dessert! And I love jelly – I’m a child of the 80s after all. So the latest recipe I wanted to try was Baked Tuna Nicoise. 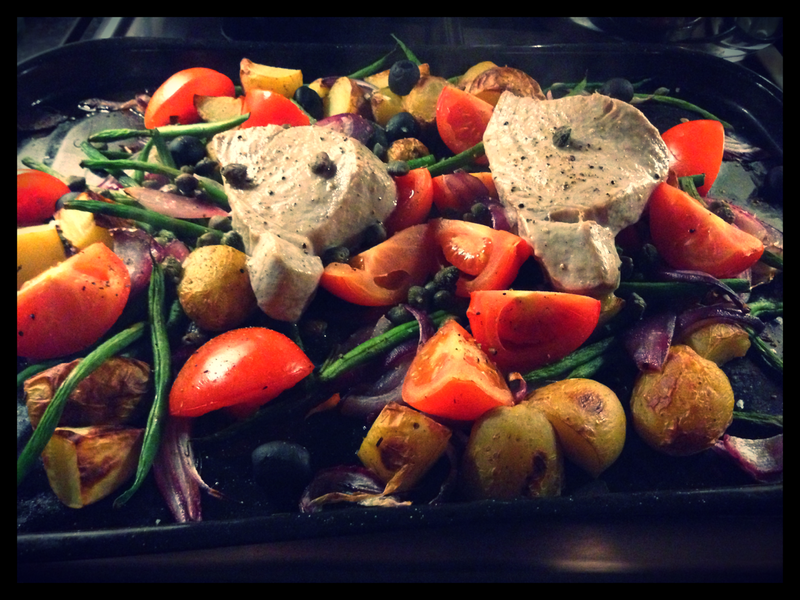 I am a big fan of fresh tuna, and this recipe also included potatoes which I’ve been craving! Total Pro Points per person – 8. The recipe is really straight forward and all done using one pan, which saves on the washing up too. The flavours are obviously a classic combination and they still work really well together in a baked dish. I actually thought the red onions were the star of the show here – they went really soft and seemed to soak up all the lemon and caper flavours. Definitely a winner. Preheat the oven to 180C fan, 200C, 400F, Gas Mark 6. Put the potatoes in a roasting tray and spray with the cooking spray, tossing to coat. Transfer to the oven and bake for 20 mins. Add the red onion and green beans to the potatoes, stir well and bake for another 1o mins. Remove the pan from the oven. Stir the potato mixture and add the olives and tomatoes. Arrange the tuna steaks on top. Sprinkle over the lemon juice and capers and then season. Return to the oven and bake for 8-10 minutes. Serve, scattered with plenty of chopped parsley. Categories: Fish, Reidbury Recipes | Tags: fish, healthy, potatoes, tuna, Weight Watchers | Permalink. It’s not even been a week on this Weight Watchers diet, but by mid-week I was desperate for something that felt like a treat. And then I saw this recipe and knew it was exactly what I needed. Bread. Chips. Burger. YES! And all for 13 points (double portion of the wedges – I still can’t get down with the teeny portions just yet). In the great scheme of things that’s healthy, but in my new Weight Watchers world that’s half of my daily points. So I really hoped it was good, otherwise what a waste! Turns out it was wonderful. The burger is packed full of flavour and it really doesn’t feel like a compromise when you bite into it! Great Asian flavours and despite being turkey, they’re really juicy and yummy. The consistency of the burgers looked a bit gloopy before they were cooked but, despite my fears, they held together really well and kept their shape. I opted to use a non-stick frying pan rather than a griddle pan and I think I made the right choice. The grilled spring onions are a great addition in terms of flavour and texture, and the sweet potato wedges are a perfect match as a side dish. KB rating 8.5/10. PR rating 8/10. WW points 13. Preheat the oven to 220C (425F or Gas Mark 7. Cut each potato into 8 lengthwise wedges and place on a nonstick baking sheet. Drizzle with oil, sprinkle with salt and rosemary and roast for 15 mins. Then toss and roast the potatoes until they’re tender (about another 15-20 minutes). Meanwhile make the burgers. Preheat a grill pan (or frying pan) to medium-high; cover to maintain heat. In a large bowl mix together the turkey, ginger, garlic, sesame oil, teriyaki sauce, chopped spring onions, coriander and egg white. Combine thoroughly then make 4 burgers – about 3.5 inches across and just under an inch wide. Place the burgers on a nonstick baking tray. Coat with cooking spray, then flip and coat the other side with spray. Put the burgers onto the heated grill pan, flipping once, until fully cooked – about 5-7 minutes on each side. A few minutes before the burgers are done, add the whole spring onions to the pan and let them go bright green and charred – about 2 mins. 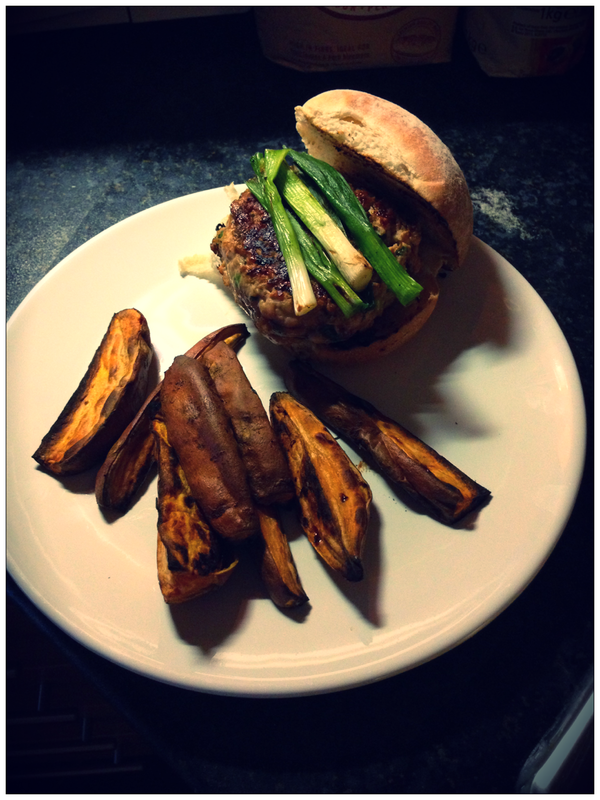 Categories: Reidbury Recipes, Turkey | Tags: burgers, healthy, turkey, Weight Watchers | Permalink.